38) Mintt Water. Take of the best Spear mint a good quantitie shred it finely over & lay it Steeping in good Canary - sack as much as will cover it, & Slice in 3 nutmeggs, & next morning Still it in an ordinary Still with a quick fire, when it is Stilled, beate white Sugar Candy very Small, & Sweeten the water with it according to your taste. This water is very good to Stay a vomiting, & to Comfort the Stomack & heart. Thime water for ye heart. Take a quart of white wine & a pint of Sack, Steep in it as much broad thime as it will wet, put to it a gallenga & Caleamus figus Aromaticus of each an ounce, Cloves mace ginger & grains of paradise of each two drams, Steep these all night & next morning distill it in an ordinary Still, & when you drink it put Sugar to it. Wormood water of the Lesser. 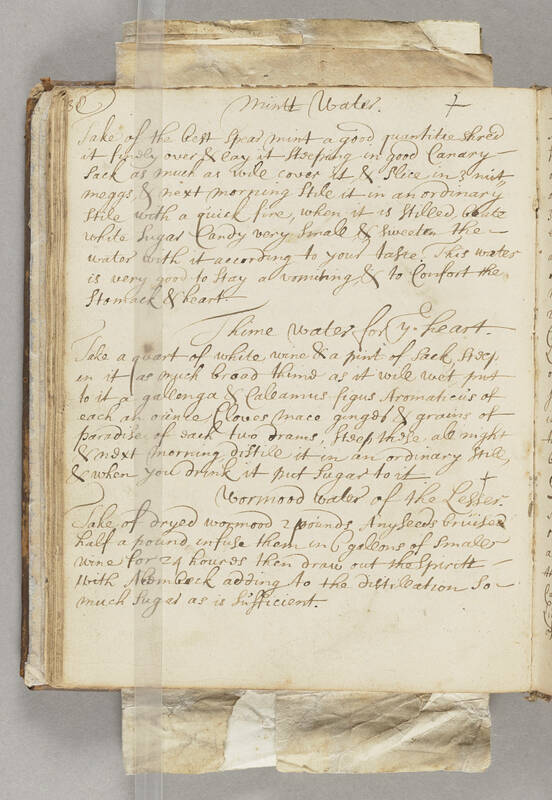 Take of dryed wormood 2 pounds Anyseeds bruised half a pound, infuse them in 6 gallons of small wine for 24 houres then draw out the Spiritt - with Alembeck adding to the distillation Soe much Sugar as is Sufficient.